After you have successfully setup a campaign, device, location and deployed it on a location and there are users logging through the network, it's time to check the data. Exporting your social WiFi users is the first step towards to analyzing the performance of your social WiFi marketing efforts. 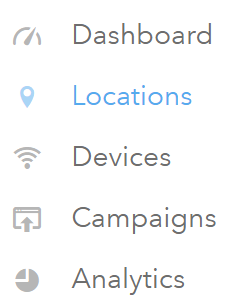 Click on Locations on the left side menu of the dashboard. Once in the Location section, search for the location that you wish to download the data from. Use the Search field if you have several locations present. Upon finding the target location, click on the Reports button. In the Reports screen, you can download each specific data in the Guest Analytics tab. Data about social logins, visits and aggregated revenue can be downloaded individually. Click the corresponding Export to CSV button. The exported data will download and can be opened on your computer. You can use Microsoft Excel or Google Sheets for CSV formatted data. You are a data scientist now!